Fact or fiction? You can shatter a glass using just your voice. This is a fact. If you generate a sound with your voice or an instrument that matches the resonant frequency of the glass, you produce constructive interference, increasing the vibration of the glass. When the vibration exceeds the strength of the bonds holding the molecules together, you’ll shatter the glass. This is simple physics. It’s easy to understand, but harder to actually do. Is it possible? Yes! Mythbusters actually covered this in one of their episodes and made a YouTube video of a singer shattering a wine glass. While a crystal wine glass is used, it’s a rock singer who accomplishes the feat, proving you don’t have to be an opera singer to do it. You just have to hit the right pitch and you have to be loud. If you don’t have a loud voice, you can use an amplifier. Put on safety glasses. You’re going to shatter a glass and you’ll likely have your face close to it when it breaks. Minimize the risk of getting cut! Clear the area of pets. Cats and dogs, in particular, have better hearing than humans and won’t appreciate your little experiment. If you’re using a microphone and amplifier, it’s a good idea to wear ear protection and turn the amplifier away from you. Tap a crystal glass or rub a damp finger along the rim of the glass to hear its pitch. Wine glasses work particularly well because they usually consist of thin glass. Sing an “ah” sound at the same pitch as the glass. 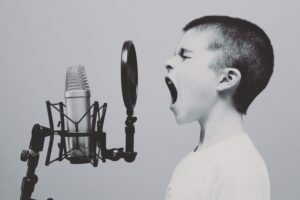 If you aren’t using a microphone, you’ll probably need the glass close to your mouth since the intensity of the sound energy diminishes with distance. Increase the volume and duration of the sound until the glass shatters. Be aware, it may take multiple tries, plus some glasses are much easier to shatter than others! Carefully dispose of the broken glass. If you aren’t sure the glass is vibrating or that you have the right pitch, you can place a straw in the glass. Slide your pitch up and down until you see the straw shake. That is the pitch you want! If you can’t match the pitch of the glass, be aware you can break the glass by singing an octave lower or higher than its frequency. Have you broken a glass with your voice? You’re welcome to post your experience and any helpful tips for success you might have! ← Is It True No Two Snowflakes Are Alike?